The Thong Lo area is best known for trendy wine bars, pricey boutique hotels and hi-so nightclubs. Going against the grain of this upscale market, Padi Madi Guest House delivers affordable rooms right next to Thong Lo BTS station. Considering the prices, they’re surprisingly stylish too. Average rating 7.2 from 992 reviews. Set in part of a large brick building at the corner of Sukhumvit and Soi 53, Padi Madi’s clean and well-appointed rooms are ideal for those seeking a comfy place to lay their head while foregoing extras like lounge and swimming pool. A bright and cheerful design includes pastel or white paint on brick walls, sleek black tile floors, tasteful paintings of orchids and some windows. It looks better once you go inside. Standards aren’t huge, and the larger superiors are worth the extra 200 baht if you intend to spend a fair amount of time in your room. Both standards and superiors are stacked with air-con, safe, fridge, desk, small LCD cable TV, coffee/tea facilities, free WiFi and modern hot water bathroom. With complimentary drinking water and daily room cleaning also provided, this is good value in the flashpacker range. Budget backpackers are also welcomed by way of small and basic, but clean, fan rooms with shared bathrooms that are sold under the name, Pink Guesthouse, but located on the top floor and run by the same folks. You’ll pay the same or even more for a dorm bed in this part of town, but do keep in mind that these are very basic rooms that tend to get hot. They do however get you a little rooftop terrace with views of the passing skytrains. The budget rooms aren’t offered on Padi Madi’s website, so inquire by email or just walk in if you’re interested. 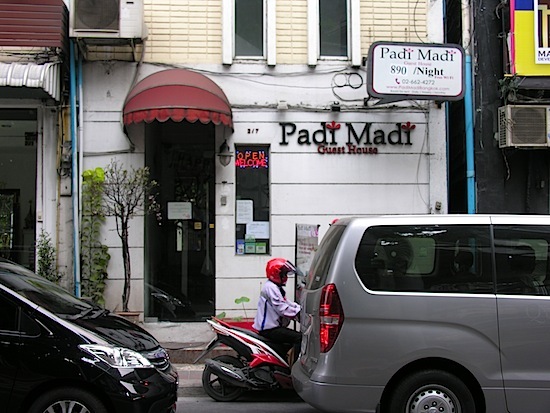 Though the rooms are great, Padi Madi’s prime Sukhumvit location is its biggest selling point. We were skeptical after reading on their website that Thong Lo BTS station is a 10-second walk from the guesthouse, but it took us less than that from the exit 1 stairs. The location also puts some of Bangkok’s most thumping nightlife within easy striking distance. Some traffic noise should be expected, though it’s not too bad thanks to thick walls and rooms facing away from the road. Other worthy Sukhumvit options in this price range include suk 11 which is a popular choice for more of a traveller scene. If you prefer a hostel, Pridi and Refill Now are worth checking out. Check rates at Padi Madi Guest House on Booking.com.